True or false? Lighter coffee beans contain less caffeine than darker ones. If you answered true, you’re incorrect. Of course, if you answered false, you’re also wrong. The truth is that the difference between the two is almost undetectable. Depending on how you measure your coffee beans, it could go either way. You see, all coffee beans start out being green and spongy. It’s not until they’re roasted that they lose much of the water they originally contained. The roasting process exposes the beans to an extreme amount of heat, which causes them to expand. Because lighter beans tend to leave the roaster sooner than the dark, they are slightly smaller in size when packaged and sold. Bean for bean, light and dark roasts have nearly an identical amount caffeine when brewed. If you’re talking volume, though, a brewed batch of light roast will contain a few more beans than the same size batch of dark. More beans, equals more caffeine…but just a tiny bit. If it’s caffeine you’re after, you can now rest easy knowing that every cup contains nearly the same amount. With that knowledge comes the freedom to drink whatever kind of brew you like the best. It’s a personal choice, as well it should be. If you haven’t yet found your dream bean, it’s time to get started. Click here for an infographic that provides more detail on each of these roasts, but remember to pay less attention to the actual category and more on taste. Try them all and then drink what you like. After all, life it too short to drink bad-tasting coffee. Want to see the roasting process in action? Check out the video linked here. You can almost smell the coffee roasting as you watch! 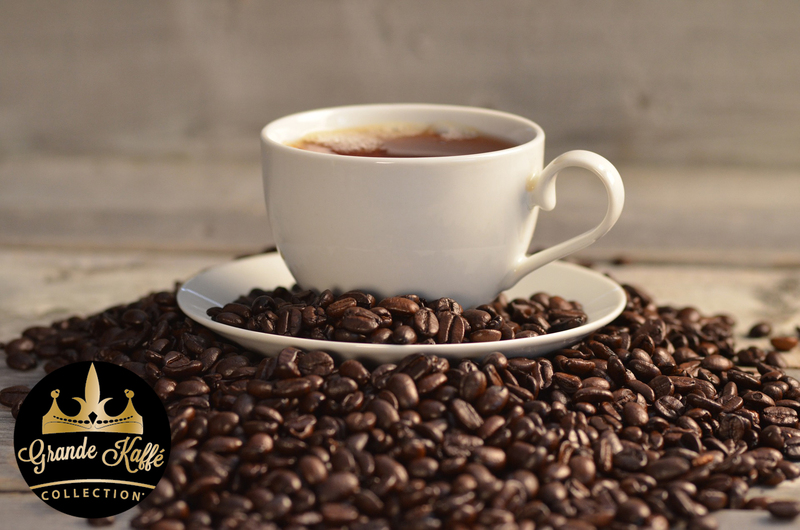 From four categories of roasts come countless varieties of coffee – and there’s no shortage of options when ordering from Grande Kaffé. This specialty coffee brand was created out of the desire to deliver the freshest gourmet specialty coffee direct to the doors of people who want and expect the best. We source green coffee beans from every coffee-growing country in the world. The beans are roasted locally in small batches to exacting roast profiles to ensure ultimate freshness. Once roasted the coffee is air cooled and promptly vacuum packed to maintain the richness, flavor and aroma that is unique to Grande Kaffé. Once only sold in retail specialty stores, Grande Kaffé is now available for order online and comes in 20 flavors. Our coffee is packaged in convenient 1-pound bags. A special collection of five flavors is also available in single-serve cups. Find your favorites and place an order today. Your dream bean awaits.